Although known mostly for her visceral and monumental “Waterfall” paintings, which are infused with a visual energy generated from her interest in Western and Eastern painting and philosophy, Pat Steir’s personal history as a painter proves to be far more complex as she reveals in her interview with Phong Bui. Steir discusses her early struggles to become an artist while keeping up with the political turmoil 60s and 70s, and she reassures us of the beauty of following one’s own calling. 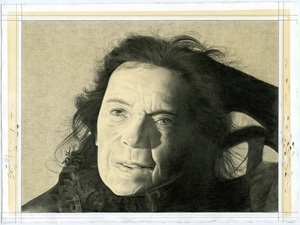 She recognizes for the first time the importance of two works she painted during her studies at Pratt Institute (1956 to 1958): “Self Portrait” and “Woman Looking at Her Reflection.” In a thoughtful refection of her early years, and the aforementioned works in particular, she realizes that a throughline has existed in her work from the very start. She also speaks candidly about her recent body of paintings at Cheim & Read (February 17 – March 26, 2011).